We are the solution to your problem. Founded in 1980, LDA Enterprises, LTD. is a critically acclaimed outplacement, career management, and candidate's agent consulting group. Employment Clinic, The Reference Clinic, and The Resume Clinic. Our Outplacement and Career Services division provides a full range of marketing and counseling support services. We assist individuals seeking to improve their career situation, find new employment, better manage career growth, or deal with internal politics and personality related conflict. Counseling support is conducted through one-on-one telephone consultation or on-premises in our Minneapolis area offices. 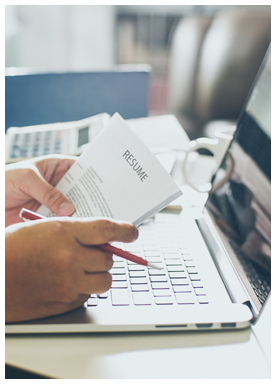 Our ResumeClinic.com division specializes in the creation of high-quality resumes, cover letters, and other motivational materials for discerning professionals who want the very best marketing tools. We provide five unique and individually tailored products. Clients that utilize our resume service receive free valuable guides to assist them as they implement their job search marketing campaign. Our ReferenceClinic division has over 35 years of experience verifying references for our clients. All clients of ReferenceClinic receive valuable benefits that are not offered through any other reference checking company. LDA Enterprises has an unwavering commitment to providing the highest quality of service in our industry. Our purpose is to help each client reach both life and career objectives through innovative and caring programs. Our guiding principles are a pledge of corporate integrity, maintaining the highest ethical standards in the conduct of business, a dedication to professionalism in every aspect of our services, and a responsibility to ensure genuine value to those individuals who have invested in our programs. Offering In-Person or Skype Conference Meetings to those who meet the above-listed criteria. Send your resume to LDA@employmentclinic.com. Copyright (c) 2018 LDA Enterprises, Ltd. All rights reserved.